2. The especial cutting system: adopting the shisht and convolute technology. The label cutting is flat, not burr. 3. The label location set assures the sleeving veracity. 4. Adopting model group design, module controlled; Achieve veracitily and fast sleeving. 5. With the good quality touching operation screen, achieving operation by finger, easy and shortcut. 6. 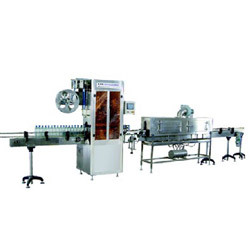 It is a high automatic packing machine. Just one person handles. Easily operation. 7. Easy to change packing material, the changeover of the mould can be easily done by hand without any tools. 8. Within the flay width limitation, can be used to package objects in different shape, no matter round or square, can be applied on glass or plastic articles. 9. High safety and stability for operation and saving time of manpower. 10. Use the Panasonic servosontrol system.